Photo: Trican Well Service Inc. The energy mix used by Canada, and the world, will continue to evolve to include more renewable sources of electricity. However, renewables such as hydro, wind, solar and geothermal are not alternatives for all oil and gas uses and products. Therefore, oil and gas will continue to play an important role in Canada as well as around the world as global population grows and energy demand increases. World-class technology and a robust regulatory framework have enhanced the safe, efficient and environmentally-responsible development of our conventional and unconventional oil and gas resources. Canada’s ability to share its responsibly developed oil and gas with countries working to advance their economy and standard of living is dependent on accessing global markets. There are many types of oil and natural gas – and Canada has them all. Conventional oil and gas reservoirs are those that are porous enough naturally that oil or gas are able to move to the drilled wellbore with little to no help from stimulation technology. Unconventional reservoirs contain abundant oil and gas but it is trapped in rock that is less porous and therefore requires additional treatment to stimulate the flow of oil or gas the wellbore and to land’s surface. Hydraulic fracturing is the technology most often used to access unconventional reservoirs. Natural gas is a naturally occurring hydrocarbon consisting primarily of methane. It may also contain small amounts of ethane, propane, butane and pentanes. 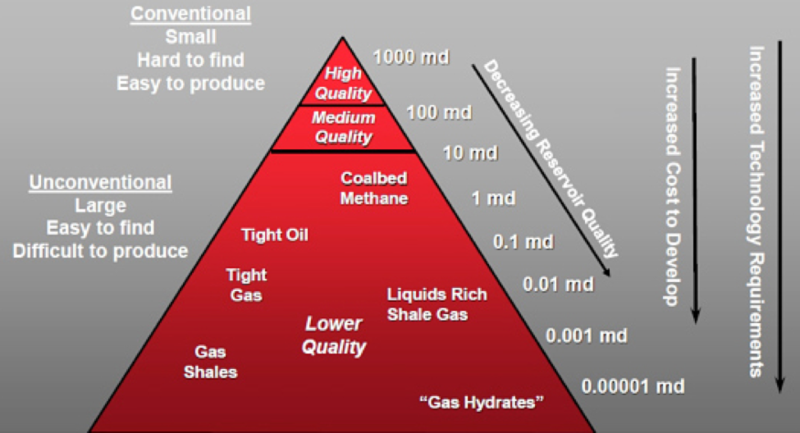 Conventional natural gas is easier to produce than unconventional gas, which includes tight gas, coal bed methane, shale gas and gas hydrates (a possible future source). Most of the growth in supply from today’s recoverable gas resources is found in unconventional formations, made accessible by innovative technologies including horizontal drilling and hydraulic fracturing. Crude oil is a black, brownish or amber liquid that is a complex mix of hydrocarbons. It consists of carbon, hydrogen, sulphur, nitrogen, oxygen and metals. Conventional crude oil flows relatively easily through a well or pipeline. Heavy oil is a more dense, viscous oil, with a high proportion of bitumen that is difficult to extract with conventional techniques. Oil sands are a thick mixture of bitumen, water, sand, heavy metals and clay. Tight oil trapped in formations of low porosity and permeability (like shale), requires horizontal drilling and stimulation such as hydraulic fracturing.